at least, that's what my mother in law tells me. i fell in love with this pink fabric from joel dewberry's line over a year and a half ago. i ordered enough of it to make the built by wendy top (simplicity 3835) but only managed to sew it this weekend. i think i procrastinated because i worried the fabric wouldn't be right for a garment. i had only seen it used in quilts and other crafty projects, but not a shirt. it was a simple enough pattern that i decided to just try it and hope for the best. and i'm pretty happy with the results. it's a little boxy, but i kind of like that about it. and i think the fabric was a perfect choice. i wish i made this a lot sooner. maybe i'll make up for that by making a couple more. and there's also that summer dress i've been meaning to make myself since last year too! ooh, sandy, that's lovely! the fit is great, even boxy. you look adorable, and i'm sure the boys will ALL wink. love it. it looks great on you! 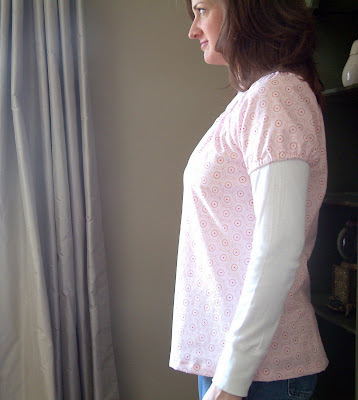 Pretty in Pink Sandy - super cute top. I bought Wendy's books a while ago and have yet to make anything - thanks for the incentive. I love it Sandy! Very cute!